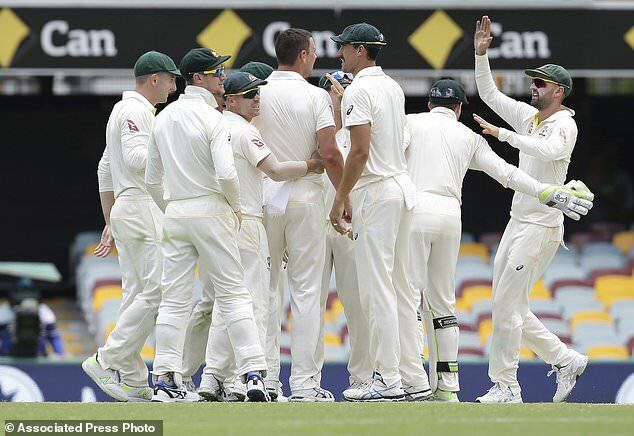 England collapsed to 195 all out in their second innings to set Australia a 170-run target on Day 4 of the first Test at The Gabba, Brisbane on Sunday. Skipper Joe Root top-scored with 51, while Mitchell Starc, Josh Hazlewood and Nathan Lyon took three wickets each. Hazlewood claimed the prize wicket of Root to have England in trouble before lunch. He trapped England captain Root leg before wicket to send the tourists tumbling to 119-5 at the interval. Root looked in good touch with his 160-minute stay before Hazlewood rapped him on the pad to the jubilation of the Australian team. Root did not seek a review and left the ground with England in trouble. Moeen Ali (40) and wicketkeeper Jonny Bairstow (42) tried to revive the innings, but failed against a disciplined Aussie attack. Earlier, off-spinner Nathan Lyon removed opener Mark Stoneman to a low catch at slip by Peter Handscomb for 27 and followed up with the wicket of Dawid Malan for four shortly after drinks.